We received an email today from Solare Ristorante announcing that longtime Executive Chef Accursio Lotà was leaving the Liberty Station restaurant's fulltime employ in order to open his own Italian eatery in San Diego. Accursio Lota is originally from the small agricultural town Menfi on the Italian island of Sicily. 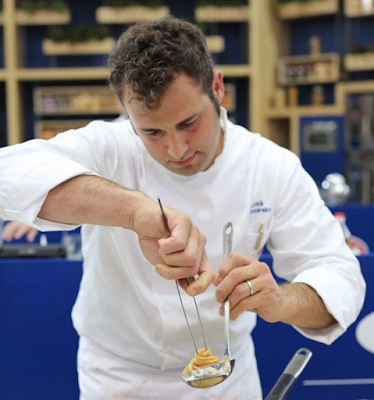 He first entered the epicurean spotlight when at age 18 he was chosen to represent his school at a national culinary competition. He then went on to work with famed Chef Sergio Mei at the Four Seasons in Milan. Accursio moved to California when he was 22 to work at the Biltmore Four Seasons in Santa Barbara, where at one point he catered a fundraiser for then-Presidential candidate Barrack Obama at Oprah Winfrey's home. The first restaurant Accursio cooked at in San Diego was at The Marine Room in La Jolla. In 2012, Accusio and his wife started an underground fine dining restaurant club called Limone, where they designed pop-up events with themes related to the seasons. In November 2012, Accursio became the Executive Chef at Solare, where he has since received numerous awards and accolades including winning the 6th edition of the Barilla Pasta World Championship in 2017 and earlier this year receiving the prestigious Three Gamberi acknowledgement from Gambero Rosso - Italy’s top food & wine rating group that is frequently compared to the Michelin Star system. "It is with great happiness for our amazing friend, Chef Accursio, that I announce that he has decided to start his own restaurant," said Solare Ristorante owner Randy Smerik in an email to friends. 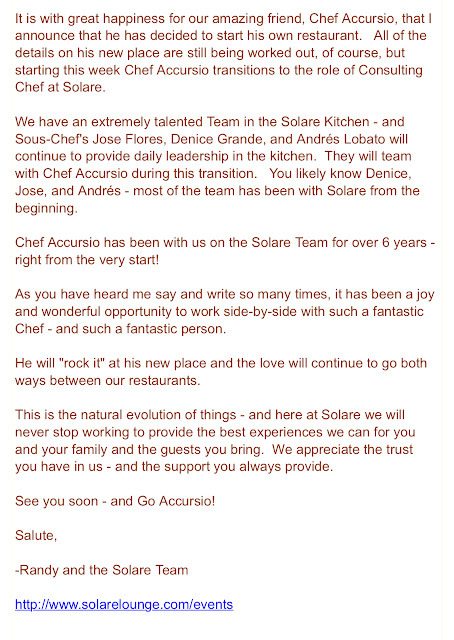 "All of the details on his new place are still being worked out, of course, but starting this week Chef Accursio transitions to the role of Consulting Chef at Solare." Chef Accursio is currently working to lock down a lease on a central San Diego space in order to develop and open his very own Italian restaurant, although nothing is yet finalized. 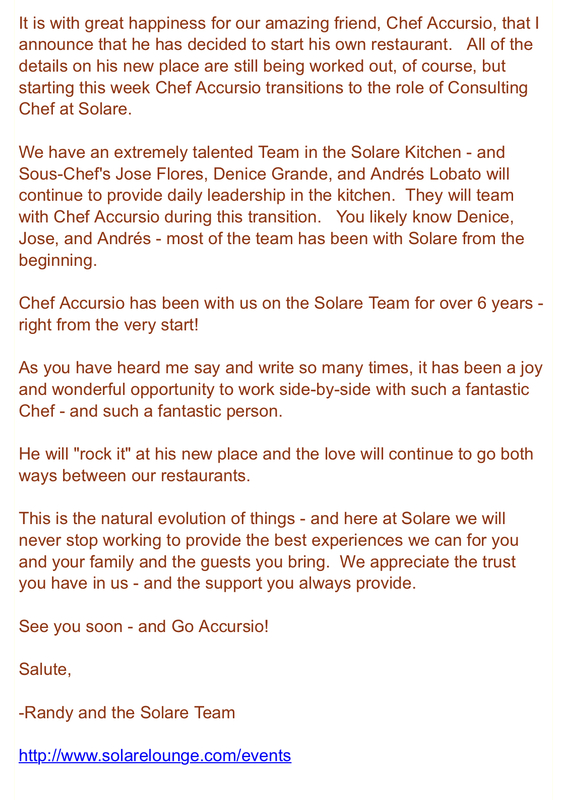 In the meantime, Accursio will continue to assist Solare on a consulting basis, with the kitchen now in the hands of sous chefs Jose Flores, Denice Grande, and Andrés Lobato.